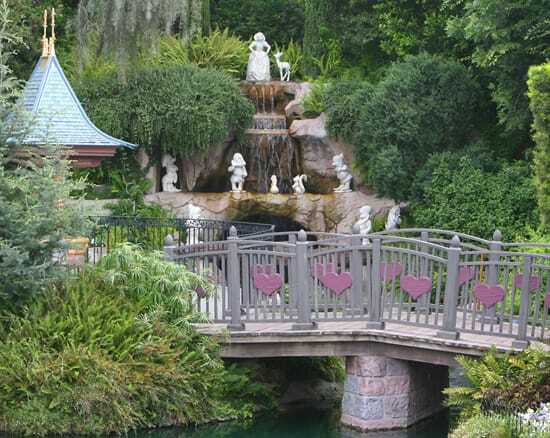 On April 9, 1961, Walt Disney dedicated the Snow White Grotto, a tranquil spot in Disneyland park you won’t want to miss. Located at the eastern end of the moat around Sleeping Beauty Castle, its quaint wishing well has launched millions of wishes into the world. Do you know the the story behind this serene locale, and how it began with a problem of proportions? The white, marble figurines depicting Snow White and the Seven Dwarfs arrived anonymously from Italy as a gift for Walt Disney. They were exquisite, but every statue was roughly the same height. How would Snow White, the princess, project her royal presence if she was no taller than Dopey? Walt Disney was determined to find a way to include the figurines within Disneyland park. As the story goes, Disney designer John Hench was perplexed when Walt first gave him the figurines to display. Then he found an ingenious and elegant solution. The major elements of the scene were scaled to create the illusion of distance and height and Snow White was placed at the top of the diorama, where she stands majestically above the scene. This created a forced perspective. Viewed from the adjacent footbridge, Snow White appears perfectly proportioned in relation to her friends. 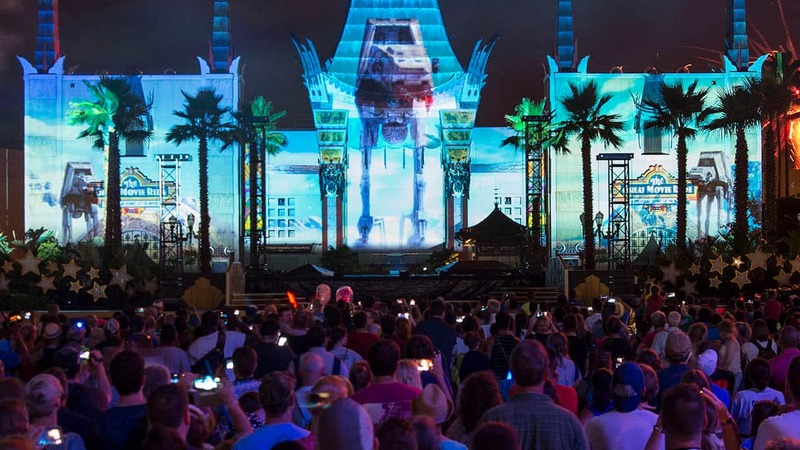 Hench did such a magical job creating the scene that three other Disney Parks have since incorporated the montage – disproportion and all – in their Castle forecourts. The soundtrack at Snow White Grotto includes chiming bells, woodland creatures and the voice of Snow White from the original movie. In 1983, as part of the New Fantasyland opening, Adriana Castelotti recreated her performance of “I’m Wishing” from the Oscar-winning 1937 film. Snow White sings throughout the day in the Grotto and even this feature has a magical quality as listeners hear the voice of the princess float out over the waterfall, then echo back from the Wishing Well. This is literally my favorite place in the park. It may also be the most romantic. I can’t wait to take a girl here someday! The story that I was told at WDI was that although the art studio was known, they do not know who the actual sculptors were and that they were students. They also said that they thought the reason behind the proportion issue was that the models used for the statues was actually based on a set of carved soaps. Bradley – that is the same information I received when I visited Imagineering in February 2011. I have also read more recent books put out by Disney that at least admitted they knew the name of the Italian sculptor – contradicting the “anonymous” portion of John Hench’s tale. For the record, I found at least one other story in his Designing Disney that was not corroborated by Imagineering & Disney’s Paint Shop. It is ingenius. Never thought of that.Brilliant story. We are great fans of Snow White and our little one just started her collection with her belove Snow White Cottage Playset and so far it is her most favorite toy and the princess.. We are happy that she loves Snow White just as we do. I never knew that, thanks for sharing this story! I proposed to my wife there at that very spot, so it is a very special place now for me and her and our families. So many people have told me that they had no idea that this was “there” after all of their visits to Disneyland. My two year old daughter makes this a required stop every week that we go. She can barely speak, yet she can sing the “Wishing” song! This is also a favorite picture spot of ours, as well as the path leading up to it, because it is one of the few locations in Disneyland where you won’t get anyone else in the background…if your timing is right. Creative! My 2 year old daughters favorite princess and a MUST stop on every visit. Love the history behind this! My fiance proposed to me in front of the falls, which makes this a special place in my heart. I went on Thursday But I didn’t have the chance to pass through there… Next time go I will go there!! I had a blast on Thursday!! According to imagineer Valerie Edwards, who talked about the sculptures during the Adventures by Disney Backstage Magic tour I had taken, the story that they were donated anonymously is false and that they were in fact commissioned by Disney from a specific Italian sculptor whose name I don’t recall, but she did mention it. She did concur that the size mix-up was an honest mistake, blaming misunderstandings when it came to converting between measuring systems. Hi Bradley, we’ll have more about this story from a Disney expert in the coming weeks. Stay tuned and thanks for reading! What a coincidence, I just read about this story yesterday in the book Designing Disney by John Hench himself. It’s a really great read! I heard this story a long time ago but forgot. Thank you for sharing it! What a cool piece of history!! We never made this area a traditional area to visit while in the parks, but after reading this we will! What a great story, thank you for sharing! Thank you for sharing this story. Our family enjoys reading about history in the Disney parks. This area of Disneyland is very special and we always visit it each trip to the park. Yes, I’ve heard that story before, and I love it! The imagineers always found such creative solutions when adding new things to Disneyland, and they still are today!